It is incredible to see how much (and increased) attention DevOps is getting in organizations today. As DevOps tool vendor, we welcome this of course, but at the same time it also confirms that successfully implementing DevOps within organizations is not as simple as it sometimes led to believe. The obvious question is then of course: Why? In essence DevOps is about improved collaboration between Dev and Ops and automation of all delivery processes (made as lean as possible) for quality delivery at the speed of business. If you want to learn more about DevOps and how to implement it in bigger enterprises, take a look at the 7 Step Strategy ebook on our website. 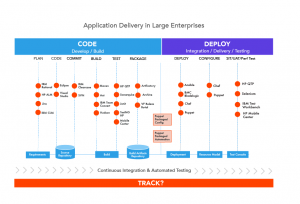 End-to-end delivery processes can be grouped into 3 simple words: Code, Track, and Deploy. “Track” is what enables improvement and better collaboration: tracking progress within the entire delivery chain. To make delivery processes lean, accurate, real-time, and factual process data is required to analyze, learn and improve. Many colleagues have written about the cultural aspects of DevOps and its related challenges to implement DevOps within the organization. I concur their statements and am generally in agreement with their approach for a successful DevOps journey. To change a culture and/or team behaviour though, especially when team members are spread globally, the organization needs to carefully think about its delivery toolchain. Why? Because a prerequisite for a culture to change, or even more basic simply for people to collaborate, is that people are able to share assets or information at real-time, regardless of location. 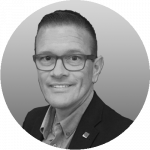 Reality in many organizations today is that people are grouped into teams and that each team has the freedom to choose their own tooling, based on platform support, past experience, or just preference. As a result, organizations very quickly find themselves in a situation where the delivery toolchain becomes a big set of disconnected tools for performing various code and deploy tasks. The lack of integration results in many manual tasks to “glue” it all together. Inevitably they all struggle with end-to-end tracking and a lot of time and energy is wasted on this. I often see this even within teams, because of the plenitude of tools they installed as delivery toolchain. SIMPLICITY is the keyword here. Funny enough this is a DevOps goal! Recall that DevOps is said to apply Lean and Agile principles to the delivery process. So why do teams allow product-based silos? Why do they look for tools to fix one particular delivery aspect only, like build, deploy, version control, test, etc.? Instead of looking for (often open source) code or tools to automate a particular delivery aspect, a team or organization should look at the end-to-end delivery process, and look for the simplest way to automate this, and importantly __without manual activities! We believe that with workflow driven deployment teams can get code, track, and deploy automated the right way: simplified and integrated! Use discussion topics that make it simpler to manage and relate project activities: code branches are mapped 1:1 with their corresponding topic (Feature, User Story, Bugfix, etc.) making them true topic branches. This will provide strong coupling between workflow and CODE. 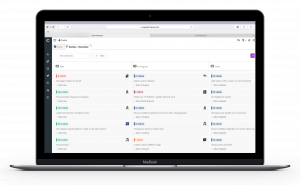 Track progress and automate deployment on every environment through kanban boards. Kanban Boards allow you to quickly visualize status of various types of topics in any arrangement. Within Clarive, Kanban topics can be easily grouped into lists, so that you can split your project in many ways. Drop kanban cards on a board simply into an environment to trigger a deployment. Simple and fully automated! This will provide strong coupling between workflow and DEPLOY automation onto every environment. Analyze and monitor status, progress and timing within the delivery process. It even makes it possible to perform pipeline profiling. Profiling allows you to spot bottlenecks and will help you to optimize pipelines and overall workflow using execution profiling data. All data is factual and real-time! This will provide you with ultimate TRACK information within the delivery process. A DevOps platform that enables true workflow driven deployment blends process automation with execution automation and has the ability to analyze and track automation performance from start till end. This is what you should look for to enable DevOps faster: A simplified, integrated toolchain that gets the job done with transparency, so organizations can concentrate on the cultural and people related aspects.